Welcome. My name is Luis Granados and I am the Chief Executive Officer of the Mission Economic Development Agency (MEDA). It is an honor to be standing here today. The adjacent park and this parking lot were long-fought-for as community benefits. It is great to see that In Chan Kaajal Park has quickly become a popular, lively meeting ground for the neighborhood. And by late next year, this site will be seamlessly anchored to the neighboring green space by a nine-story, 127-unit, 100 percent affordable-housing development for our families and transitional-age youth. I especially want to thank our partner in this work, Chinatown CDC, who has shared their expertise in this field throughout this process, and, through their actions, have shown us what true partnership looks like. I also want to thank City officials for their support, and their hard work in making this project happen. And then there is our Mission community. You took a leap of faith and entrusted this team as stewards of creating your longtime home. It was a pleasure for our team to get to know each of you during the many community meetings we sponsored. Your feedback translated to a beautiful design — with that community vision being brought to life by renowned Mithun Architects and Y.A. Studio. 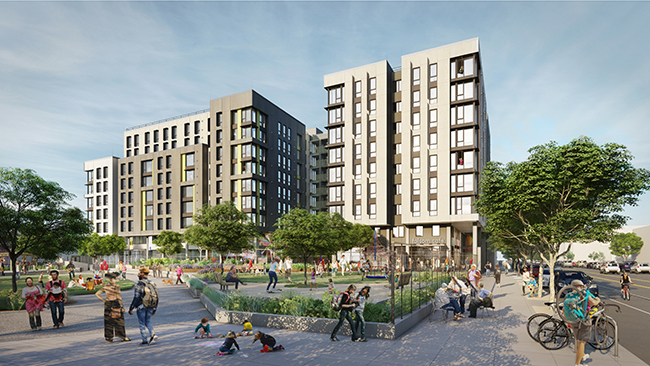 Casa Adelante – 2060 Folsom is just one piece of MEDA’s multi-pronged strategy for affordable housing. We now have almost 1,200 units preserved or in the pipeline. However, we recognize that the housing crisis in the Mission and in San Francisco remains. We are all only at the beginning of this journey in our path to address the Mission’s housing needs. More new units so displaced residents can return to their home. More acquisition of existing apartment buildings to keep families in place. More affordable spaces to house community groups that provide vital services to the Mission, San Francisco and beyond. And more affordable commercial spaces for our family-serving businesses. Residents: continue fighting for what you need. Community groups: continue to stand up with, and alongside, our community. Investors: continue to finance projects that keep people in place, rather than displace. Public officials: continue to push the limits of what can be done, given the resources available. I want offer two last sets of thanks. First, to the San Francisco Mayor’s Office of Housing and Community Development, led by Kate Hartley, for trusting us to tackle this important development. We know that you are working hard to deliver projects like this one — and trying to address the needs while managing expectations. Lastly, I want to recognize Karoleen Feng, MEDA’s Director of Community Real Estate. We know how talented you are, how much you have achieved and how you daily push yourself beyond your limits to meet the Mission’s housing needs. I now welcome Karoleen to the stage. As you all know, the Mission has been in transition. When MEDA became the lead agency for the Mission Promise Neighborhood education initiative in December 2012, it became the catalyst for the development of Casa Adelante – 2060 Folsom. How do we make sure these residents — our families — are strengthened as transitions occur? Young ones transitioning to different grade levels. First-generation high schoolers prepared to succeed in college. It’s about keeping the promise. Our vision has always been for Casa Adelante – 2060 Folsom to be unrivaled as providing affordable housing with such built-in family services. Think of it as birth-to-career resources for residents and the public alike. That’s why the plan is for 2060 Folsom to be the new home for a trio of longtime Mission-based organizations, all joining us this evening: PODER; Good Samaritan Family Resource Center; and Mission Graduates. Plus, there will be additional on-site services provided by Larkin Street Youth Services and our invaluable co-developer in this project, Chinatown Community Development Center. Whether you are a City official, a funder, a stakeholder, a partner or a community member, you all had part in making Casa Adelante – 2060 Folsom a reality. It is an honor for MEDA and Chinatown CDC to build affordable housing for some of our most vulnerable San Franciscans: low-income families and transitional-age youth. Being low income should never translate to displacement from your home and neighborhood, or, worse yet, homelessness. It is important to note that 29 apartments in this building will be for formerly homeless San Franciscans. Today’s groundbreaking represents a big step in the right direction, as we keep San Francisco the diverse welcoming city we all love.